After 41 years of producing many of the country’s best interior designers in a cramped, unattractive building on Chino Roces Avenue in Makati, the Philippine School of Interior Design (PSID) will finally move in October to a new, bigger and better home at The Fort in Taguig. 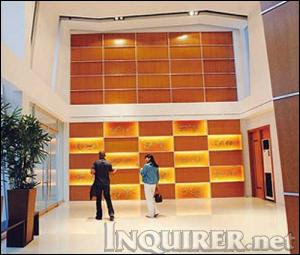 Inset Photo: THE INSTITUTE’S spacious lobby evokes the look and feel of a hotel. The three-story building on Bayani Street, with ample basement parking, will be known as the Asian Institute of Art and Design (AIAD). It will have a spacious, high-ceilinged lobby, irregular ceiling treatments, and sculptural details in corridors and laboratories. Said to reflect the timeless appeal of a hotel and the functionality of an institution, the lobby took its cue from PSID’s old building by incorporating several letters in the alibata (ancient Filipino alphabet) into its design. Each letter, done in Verdigris metal cutwork that illuminates aluminum frames and veneer-clad walls, stands for the Filipino equivalent of PSID. While students used to form single files to go up and down the narrow staircase in the old building, they can now move with ease on a wide concrete-and-steel staircase. The improvements extend to laboratories and lecture rooms. “Instead of flat ceiling, I designed an irregular one that could stimulate students’ imagination and improve the lab’s acoustics,” says interior designer Nicky Jardenil, one of PSID’s faculty members. Like a blank canvas, PSID’s four labs and two lecture rooms on the first floor are done primarily in white. The lecture rooms’ ceilings, however, are designed flat and unobtrusive to allow students to focus more on the teacher. As a teacher himself, Jardenil understands how hard it is to gain young people’s attention (although, majority of PSID’s students are already college graduates). He thus equipped each lab with a sound funnel made of gypsum board jutting out from the wall behind the white board. “Whenever the teacher talks in front, the sound, instead of going up, goes directly to the students,” says Jardenil. Each lab has tables that, with few minor adjustments, double as drafting boards. Students no longer have to bring their portable boards when lab activity shifts from lectures to actual rendering. Axent Wood of Cebu, owned by Mark Cancio, designed and manufactured the special tables and sturdy classroom chairs made of several kinds of wood. For the first time, too, PSID will share its building with another field of related learning. The expansion will thus be literal and figurative, as the AIAD houses the Specialized Art and Design Center (SADC). To occupy the second floor, it will offer special courses for professional artists such as muralists, graphic and lighting designers. To open it, muralist Alfred Galvez will conduct workshops on decorative faux finishes. Pambid and company will also invite experts to hold short seminars on flower arrangements, table settings and Christmas decor. As early as 2002, Rosario Cancio-Yujuico, PSID president, first thought of putting up a new building befitting the school’s stature and to accommodate the burgeoning student population. It wasn’t until 2005, however, that actual work on PSID’s dream home began. Yujuico also sought the expertise of architects E.G. Regalado and Oscar Inumerable. Now that PSID can accept more students, Pambid and his colleagues are optimistic. They also look back with pride on the years they spent molding future interior designers in an unbelievably small building.